The lessons New Mexicans can take from French politics are few and far between, but in recent weeks violent protests have rocked France and the issue has been taxes levied for the alleged purpose of reducing climate change. Given that a gallon of gas already costs $7.00 in France and that much of that is taxes (France’s fuel taxes – 64% on unleaded and 59%) it is hard to compare the situation with here in New Mexico where a gallon of gas can be had for less than $2.00 at some Albuquerque locations. But, the additional 10 cent a gallon global warming tax was apparently enough to push many French over the edge and even into violence. Hopefully that kind of political violence is never visited upon us here, but I also hope that taxes don’t drive the cost of gas up to $7.00 a gallon either. The lesson for us? While France’s political culture may be way to the left of us here in the US and New Mexico, when push comes to shove global warming and climate change just aren’t good enough reasons for most people to pay more in taxes. Of course, highlighting the many differences between France and the US is the fact that the latter gets 40% of its electricity from CO2-free nuclear thus France is already among the most CO2 efficient developed nations. Despite this proven success and decades of safe operation nuclear remains deeply-unpopular with American environmentalists. Just doesn’t make sense with the cold winter forecast. https://www.foxnews.com/us/winter-will-be-teeth-chattering-cold-have-plenty-of-snow-farmers-almanac-claims Reducing CO2 is all about global warming and only exacerbates a cold winter. Liberals claim humans are causing climate change in general but all the carbon hoorah only addresses global warming. I figure as long as the five day forecast is inaccurate, we’ve got nothing to worry about a 100 year forecast. I am no expert but it has just occured to me that taxes were meant to provide a service to the people or money to run the government. 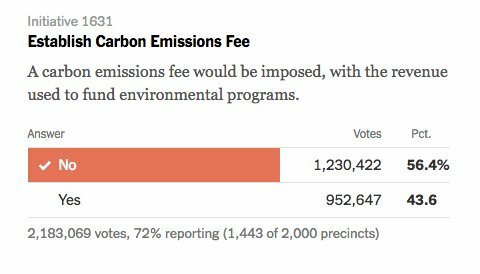 It seems to me that a CO2 tax is unConstitutional. Am I just being naive? I doubt they would be unconcstitutional or found as such. If Congress wants to impose them, they can do it.